It’s a luxuriously creamy Italian pasta dish with lots of smoky bacon that will make any pasta and bacon-lover’s dream come true! Although a very simple dish, don’t underestimate the flavor of this Spaghetti Carbonara recipe by Kraft. It not only looks, but tastes gourmet! Easy and ready in 20 minutes. While boiling the spaghetti, the bacon and onions are cooked until ready and drained, before all the ingredients are placed back in the skillet until the desired creamy consistency. Perfetto! Italian restaurant-worthy flavors. Why go to a restaurant when you can indulge on an ultra delicious pasta dish right at home with your family? Serve with a side salad or tomato and squash side dish and some garlic bread. Oh, and don’t forget the wine! Buon appetito! 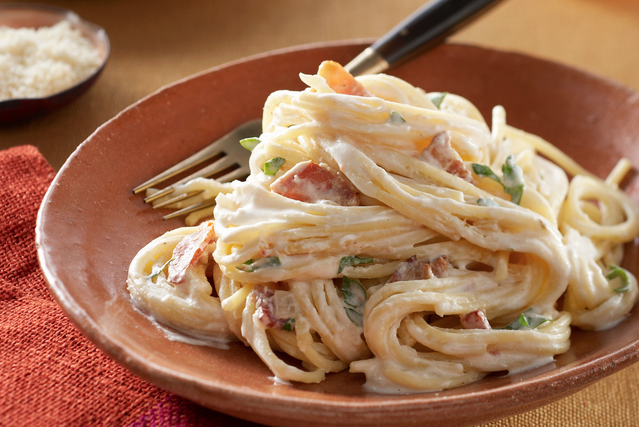 Rich and creamy pasta with smoky bacon flavor. Exquisitely delicious! Meanwhile, cook and stir bacon and onions in a large skillet on medium-high heat 8 minutes, or until the bacon is crisp and onions are tender. Remove from the skillet and place on paper towels. Wipe the skillet with paper towel, or leave a little excess of bacon fat if you prefer. Drain spaghetti and immediately add to the skillet with the bacon mixture and all remaining ingredients. Toss until the cream cheese has completely melted and the mixture is well blended and serve immediately. Recipe pairs well with a delicious glass of Pinot Grigio or Chablis. For delicious breadsticks, try Olive Garden’s Famous Breadsticks recipe here! Want A Great Side Dish Recipe? Now Watch How To Make Bloomin’ Garlic Bread!